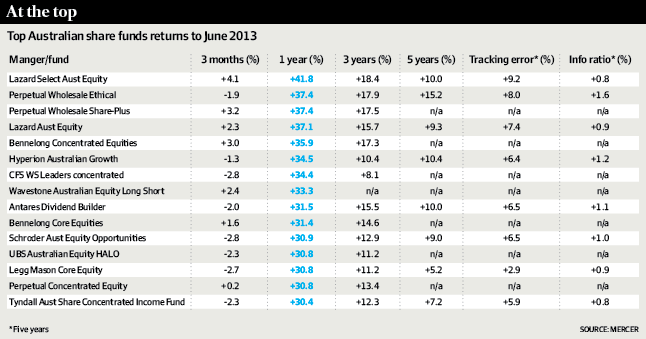 The above table was published in yesterday’s Australian Financial Review (the sourced link takes you there but you may need a subscription) and Lazard Select Equity is the top performer over the last 12 months, and from the other funds in this table, its number one over the past 3 years too. So I thought I’d have a look to see how Lazard’s alpha (or market risk and style-adjusted skill/outperformance) has really been over time. So…as the below chart shows, Lazard has had some significant bouts of tough times and its numbers have only really looked great over the last 6 months. In fact, if you delve deeply…and I don’t have the charts available for posting yet…it is only the last 6 months performance that have truly contributed to high returns…not that there’s anything wrong (or necessarily right) with that. 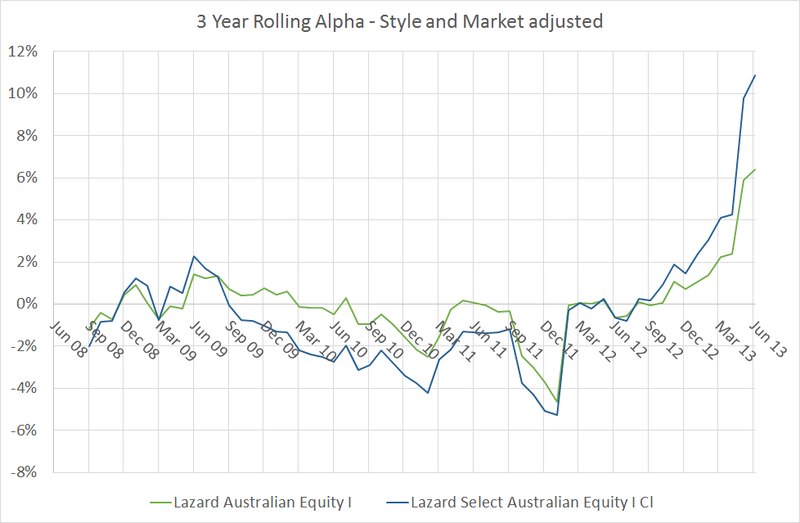 One final positive (or negative depending on your view) for Lazard and a personal observation based on my analysis…its Select fund appears to have taken on the most idiosyncratic risk (or is prepared to move furthest away from the S&P/ASX200) of every fund in the list. So it definitely takes the biggest bets and they’ve finally paid off this year. Also, with the exception of the Wavestone Long/Short fund, Lazard Select also has had the lowest exposure to the market (i.e. low beta) which is quite interesting as high beta has been an absolute winner over the past 12 months…and you only have to look at the performance of some of the geared share funds as evidence to that point. So without talking to Lazard, I’m pretty confident they make big bets and those big bets have worked this year…but will they continue??? Who knows. More analysis to come of this interesting table. I probably should put a disclaimer in…no personal circumstances have been considered in conducting this analysis and under no circumstances am I recommending or not recommending Lazard funds…this is simple factual analysis and not much more…oh yeah…obviously past performance does equal future performance!